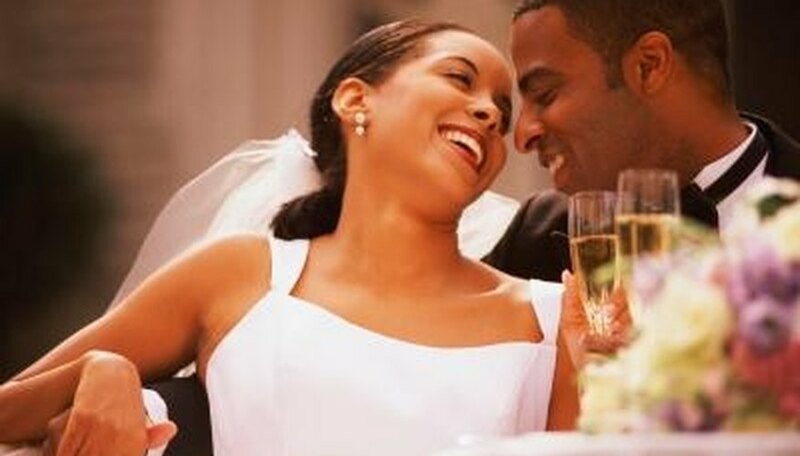 Your wedding will most likely be one of the most romantic days of your life. Share that feeling with your wedding guests by creating a romantic setting through your reception decorations. The decorations you choose will create the ambiance of your event. The romantic setting will live on in all of your wedding pictures, reminding you of the special day for the rest of your life. Share your romance with your wedding guests through your reception decorations. Lighting can set the tone for your entire reception, so use it to your advantage. Too much lighting will create a harsh and bright look that doesn't lend itself to a romantic feel. Instead, use soft and twinkling lights. Miniature white lights can be wrapped around trees, columns or twisted with clear tulle and strung up around the room. Line the walkways or flank the doors with lanterns holding candles. Your reception lighting should be bright enough to see your guests, while dim enough to create a romantic ambiance. The linens you choose can add to a romantic atmosphere. Light, airy fabrics, such as tulle or organza, can flow and bring to mind the fluttering feelings of being in love. Rich fabrics, such as velvet or satin, also work to create a romantic atmosphere with their luxurious textures. Drape your tables with solid linens and swags of your favorite material in your wedding colors. Wrap twinkling lights in tulle for a soft, glowing effect. Add a velvet or satin runner sprinkled with rose petals down the main aisle or walkway in your reception venue. Flowers tend to create a romantic atmosphere on their own. Large bouquets of roses -- or whatever your favorite flower is -- can serve as centerpieces or decorate columns or urns throughout the reception venue. Sprinkle rose petals around the tables, and add fresh flowers to the cake or wherever you want them included. Alternatively, strands of flowers -- real or silk -- can be draped over tree branches, wound around columns, or dangled from the ceiling to create a soft and romantic feel. For example, hot glue cherry blossoms to a long vine and hang them from the ceiling. Your guests will likely spend quite a bit of time sitting at their tables. Set the mood with soft, yet simple, arrangements. Fill glass fish bowls with water, sparkly pebbles and floating candles. Surround a water fountain with pebbles and candles. Build any candle centerpiece on a mirror to allow the reflection of the flames to add to the romantic ambiance. Alternatively, use ice sculptures or rhinestone-covered hearts, swans or interlocking rings. Use square vases to hold floral arrangements and affix pictures of the couple from various stages in their relationship, such as the proposal, a beach vacation, or any picture that screams love and romance. Bass, Janece. "Romantic Reception Decorating Ideas." Dating Tips - Match.com, https://datingtips.match.com/romantic-reception-decorating-ideas-8419572.html. Accessed 19 April 2019.